Newly manufactured by Speer through their Duty Line, this product produces the consistent massive expansion you've come to expect from Speer Gold Dot ammo. In addition to its impressive weight retention thanks to its molecularly bonded jacket, this round also features flash suppressed propellants and have a wickedly fast muzzle velocity of over 3000 fps. 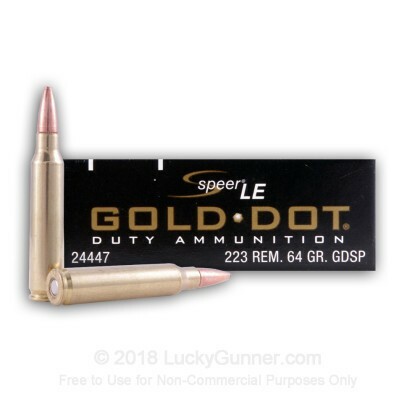 If you're looking for a round that you can trust in your AR-15, you can always trust Speer Gold Dot 223 Rem. Buy a box or two today and shoot it this weekend, you'll fall in love with your black gun all over again. Each round is brass-cased, boxer-primed, non-corrosive and reloadable. It is precision manufactured in the United States by the well-known Speer brand. I researched this history and reviews from other users concerning this ammunition before I purchased it. I like the reported penetration results from windshield penetration and weight retention. I also liked that it has a low muzzle flash. I gave it a 4 on performance because I've not had to use this bullet in a violet situation or done a test myself. 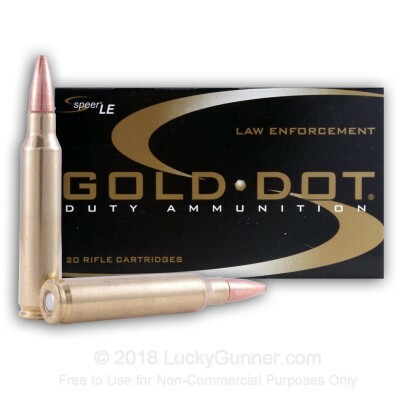 I also carry Speer Gold dot as duty ammo 180 jacket hollow point,.40 cal. I think it can be a good round for urban and rural operations. Each shooter has their preference. Lucky gunner always delivers promptly. Speer gold dot is top of the line! Its nice to get a soft point that's not a pointed soft point. I recommend them to anyone. & 3 days isn't a long time to wait for the ammo you want!!! 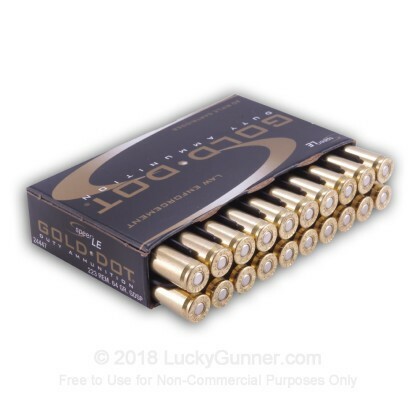 While I generally use cheaper ammo for the range, I've tested 120 rounds of this ammo at the range to gauge its performance prior to deciding if I would rely on it for SD . Clean ammo, reliable and jam-free. Will definitely be purchasing some more; although not for the range.